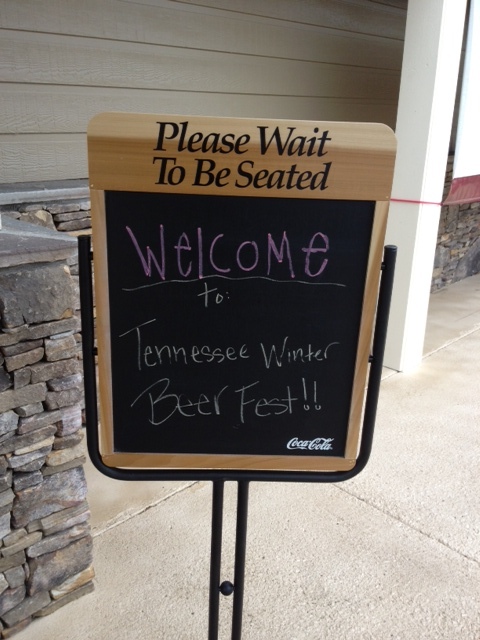 Hey readers, I figured I’d update the ol’ blog and let you know how the TN Winter Beer Festival went. It was (insert positive exclamative adjective here)! I had a really good time. As you know, the festival took place at the Laurel Valley County Club in Townsend. It was held in the clubhouse which is 2 stories. Upstairs had Depot Street and Smoky Mountain Brewery pouring their tasty concoctions. Downstairs had Woodruff and Marble City side by side. I wore my Woodruff shirt to the event and I’m glad I did. By the time it occured to me that I should ask for a volunteer t-shirt, they were out of my size. I knew most of the other volunteers, but since the event was limited to 180 tickets, by the end of the night, it felt like everyone knew everyone. Since I wore my Woodruff shirt and am a good friend and supporter of the brewery, I helped pour beer for them all night. The photographer for the Daily Times took a great picture of me doing just that, that you can see here. As ticket holders came in the door, they were given a t-shirt, a pint glass and a poker chip. Each brewery had a large beer mug in front of their taps. People were instructed to vote for thier favorite beer or brewery by placing the poker chip in the mug. There was some stiff competition. 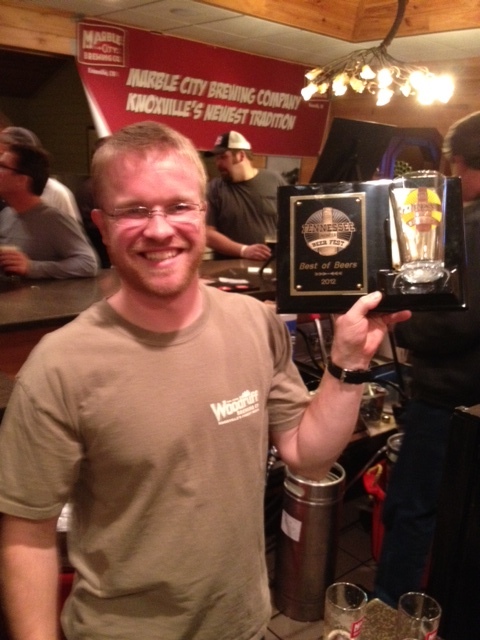 Since I was representing Woodruff, and consider the Downtown Grill & Brewery my home away from home, I really wanted Dave to take home the “Best of Beers” trophy. As I was pouring beer I noticed 2 things. There were the tried and true beer connoisseurs who absolutely loved the seasonal, high gravity Captain’s Winter Ale. There were also more then a few people who weren’t necessarly beer drinkers, but came out to support the event. This crowd absolutely loved the Downtown Blonde, which also happened to be the lightest beer being poured. The combination of votes from craft and light beer drinkers turned out to be the winning combination for Woodruff. Dave took home the coveted trophy! I do want to thank Dave for generously offering me the extra bed available in the cabin that he and some others were staying at nearby. He offered it so I could drink and not have to worry about sobering up to drive home to Knoxville. I was going to take him up on the offer, but around 7 pm, my kidneys started to ache. By 7:30 I knew I was done sampling beers and had switched over to water. By the time the event ended at 9, I was stone cold sober. I helped clean up, said my goodbyes & drove home to the comfort of my own bed. I am vrey much looking forward to next year’s TN Winter Beer Fest. Make sure to check out Don’s post about the festival at Knox Beer Snobs. One more thing before I end this really short post. April 14th is the Thirsty Orange Beer Festival in Johnson City TN. Check out this great post about it on Tattood Brew’s website. I am heavily involved in helping to organize this festival. I think my big claim to fame is that I came up with, and wrote the rules for the Iron Brewer competition. As we get closer, I’ll write a proper post about it. As for my next post, I’m thinking about doing a step-by step tutorial on the kegerator I’m building. This entry was posted on Thursday, February 9th, 2012 at 19:32 and is filed under #knoxbeer, Beer Festival, Craft Beer, Drinking, home brewing, Knox Beer Crew, Knoxville Beer, Knoxville beer blog, Ratchet, seasonal, Tennessee Beer Festival, Winter Warmer, woodruff. You can follow any responses to this entry through the RSS 2.0 feed. You can leave a response, or trackback from your own site.